So tomorrow it’s official. 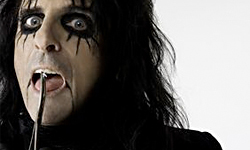 The Rock and Roll Hall Of Fame and Museum induct Alice Cooper! Though the ceremony takes place in New York everyone knows the real party is in Cleveland. Watch the 2011 Induction Simulcast at 8:30PM on MARCH 14th at the RHOF $5. With their upcoming induction into the Rock and Roll Hall of Fame, Alice Cooper, is acknowledged as one of the most influential bands in rock history. At inception forty years ago, the group shocked the world so fundamentally that it seems to have taken a preternaturally long time for their incredible talent to be recognized. In 1970, Alice Cooper flipped hippie ideals on their head and astonished the world, “driving a stake through the heart of the Love Generation,” as the group’s namesake put it. Typically we avoid promoting corporate stores however this commercial is too cute to avoid. This one goes out to all of our friends that have recently went back to school. Best wishes for a great year.